BM2 comes in with a choice of four different types of head to fit in every individual need. achromatic DIN standard objectives 4x, 10x, 40x (spring) and 100x oil (spring). Each objective is parfocality adjustable and free from axial and chromatic aberrations. the best and reliable result. (130mm x 125mm) is equipped with low position coaxial controls for ease of operation. 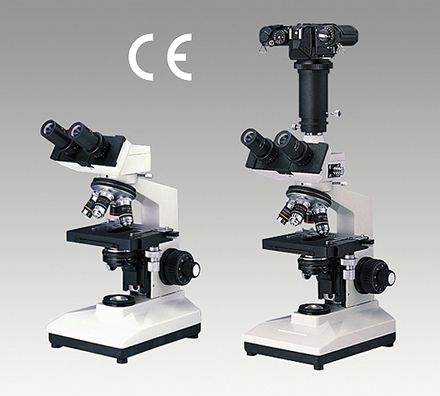 to 0.1mm for accurate relocation of specimen areas. prevents the stage from moving beyond a safe limit once the specimen is focused. with the stage at its upper limit. contrast and resolution can be easily obtained with the iris diaphragm and blue filter. Electrical : All electrical parts are arranged according to CE, VDE, UL and CSA requirements. scientific and mechanical progress, without notice and without obligation.